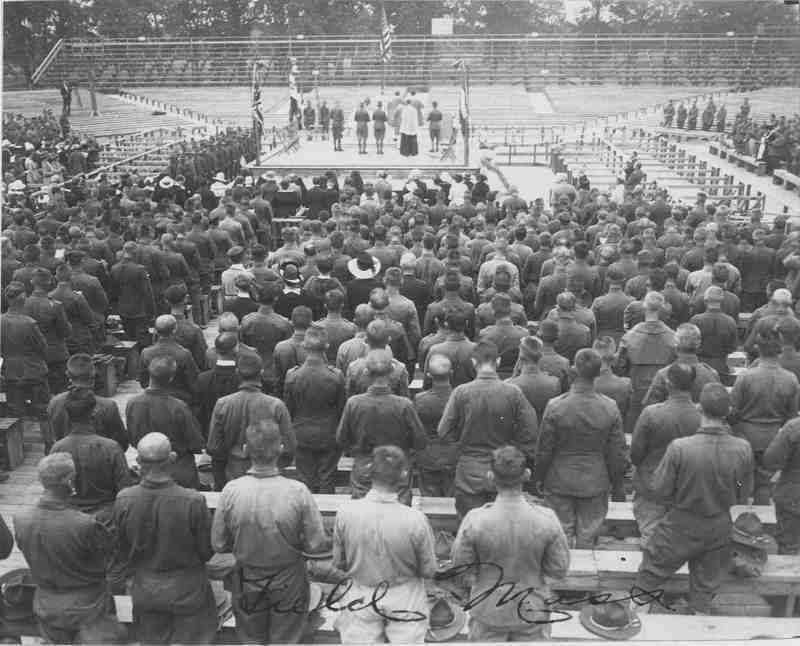 Field Mass at Camp Grant, Rockford, IL. National Archives. During the American Revolution, there were no Catholic chaplains ministering to American troops. However, about 100 chaplains were among the more than 12,000 French soldiers who began aiding America in 1777. The American government continued to make no allowance for Catholic chaplains in the years that followed. There were no Catholic chaplains to minister to troops in the War of 1812. It was only in 1846 that President Polk asked Archbishop John Hughes of New York, along with Bishop Michael Portier of Mobile, AL, and Bishop Francis Kenrick of St. Louis, MO to suggest two priests who could serves as chaplains for the ongoing Mexican-American War. These two priests were Father John McElroy, SJ, and Father Anthony Rey, SJ. Although the bishops were also asked to supply a chaplain for the Navy, they were unable to find a priest to spare. The first Catholic Naval chaplain wouldn’t be commissioned until 1888. During the Civil War, the number of Catholic chaplains was increased to about 100. President Lincoln made the policy that every colonel in command of a regiment had the right to choose the chaplain for whom the majority of the officers on duty had voted, which led to an increase in the number of Catholic chaplains serving Catholic-heavy regiments. A number of Catholic priests also served the military as unofficial chaplains. The Spanish-American War saw relatively few Catholic chaplains, only about 12 between both the Army and the Navy. One of the most famous was Rev. John Brady, who would also serve as a chaplain in the First World War.